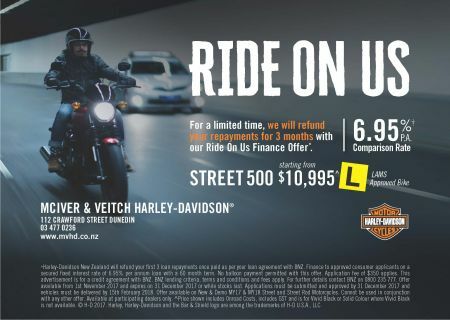 New Harley-Davidson® Street 500 from $10,995, no deposit, 6.95% interest rate, over 60 months - only $52 a week plus we'll refund your first 3 months of payments. And it's LAMS approved! See T&C's below. *Harley-Davidson New Zealand will refund your first 3 loan repayments once paid as per your loan agreement with BNZ. Finance to approved consumer applicants on a secured fixed interest rate of 6.95% per annum loan with a 60 month term. No balloon payment permitted with this offer. Application fee of $350 applies. This advertisement is for a credit agreement with BNZ. BNZ lending criteria, terms and conditions and fees apply. For further details contact BNZ on 0800 235 777. Offer available from 1st November 2017 and expires on 31 December 2017 or while stocks last. Applications must be submitted and approved by 31 December 2017 and vehicles must be delivered by 15th February 2018. 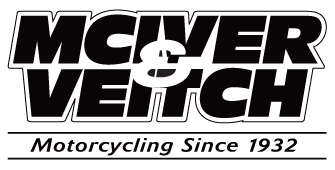 Offer available on New & Demo MY17 & MY18 Street and Street Rod Motorcycles. Cannot be used in conjunction with any other offer. Available at participating dealers only. ^Price shown includes Onroad Costs, includes GST and is for Vivid Black or Solid Colour where Vivid Black is not available. © H-D 2017. Harley, Harley-Davidson and the Bar & Shield logo are among the trademarks of H-D U.S.A., LLC.